MIAMI (Reuters) FIFA presidential candidate Prince Ali Bin Al Hussein of Jordan has criticized the global body’s decision to cut off funding to corruption hit Americas confederations, calling it “collective punishment”. In a statement on Wednesday, Prince Ali questioned Monday’s announcement by FIFA that they had put on hold payments to CONCACAF and CONMEBOL, the two confederations that have been most affected by the corruption scandal engulfing football governance. CONMEBOL is responsible for the sport in South America, while CONCACAF covers North and Central America and the Caribbean. Officials from the Americas make up the overwhelming majority of the 41 individuals and entities that have been indicted by the U.S. Department of Justice. “I have read reports that a FIFA spokesperson has announced that funding to CONCACAF and CONMEBOL has been suspended with immediate effect,” wrote Ali in a statement issued to media. “Who is the spokesman; which FIFA committee does he represent; who decided that 45 Member Associations should suffer collective punishment as a result of individuals’ bad actions; who decided to hold these votes to ransom less than three weeks before the election and who exactly will decide when the funding will be reinstated?” concluded the statement. A spokesman for FIFA’s Audit and Compliance Committee told Reuters that they had made the decision to stop the payments to the two confederations but declined to comment on Ali’s statement. FIFA’s media department declined to comment beyond reissuing the statement they had released on Monday. “We can confirm that in light of current proceedings involving individuals related to CONMEBOL and CONCACAF, FIFA has put contributions toward these two Confederations on hold until further notice. CONCACAF has seen its last three presidents indicted by the Department of Justice with Trinidad and Tobago’s Jack Warner, Cayman Islander Jeffrey Webb and Honduran Alfred Hawit all facing charges. CONMEBOL has had former president Nicolas Leoz and their most recent leader Jan Angel Napout, both of Paraguay, indicted along with several other leading officials. The two organizations are due to hold a joint ‘Copa America’ tournament in the United States in June to celebrate CONMEBOL’s centenary. 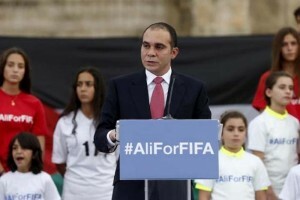 Prince Ali is hoping to be elected FIFA president in the vote on Feb. 26. Also standing are Asian Football Confederation (AFC)President Sheikh Salman Bin Ebrahim Al Khalifa, former FIFA deputy general secretary Jerome Champagne of France, South African businessman and politician Tokyo Sexwale and UEFA general secretary Gianni Infantino.